When visiting classrooms, I often feel for introverts—those who prefer to work alone and gain strength from their own thoughts and ideas. Classrooms have been transformed into collaborative factories, full of teamwork, groupwork, small groups, debates and discussions. Let me say right off the top, that I believe these configurations are valuable to students and help prepare for them for the work force, which depending on the field and job, more than likely will be designed around collaboration. Nevertheless, maybe we’ve gone too far in requiring students to work together for long periods of time. Have we forgone the needs of the introvert? In our efforts to create collaborative, collectivist classrooms, have we designed anti-introvert environments. Introverts are those that enjoy solitude and feel drained by social interaction. They are not shy or necessarily social awkward; in some cases, they can be very social adjusted. They just prefer working alone. I consider myself an introvert. I can socialize and regularly collaborate with others on research and projects. However, given the choice, I enjoy my own space and solitary work (like writing this blog by myself at the kitchen table right now). In her interesting read, Quiet: The Power of Introverts in a World That Can’t Stop Talking, author Susan Cain makes the case for how introverts often produce creative breakthroughs and increased productivity. She examples Apple co-founder, Steve Wozniak, who often worked alone and believe his best ideas came during his introverted periods. Cain also questions the current GroupThink, collaborative structures in schools, citing research that shows some students spend nearly half the school day in close working relationship with classmates. When planning lessons, design opportunities for students to work independently. 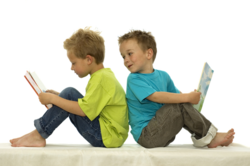 Perhaps during reading, they can go off to a corner beanbag and complete an assignment alone. During discussions, students might have options to complete written responses. During group projects, students could have options of working alone –in their own cubicle or office so to speak-before coming back to the group to share. Re-consider the seating arrangements in classrooms. Often, I see desks arranged in small groups or students sharing tables. Offer students a chance to sit in desks alone at times or have tables and desks positioned near corners, with some plants or other furniture, providing a little breathing room. Also, allow students to occasionally spend time alone during recess. After being with others in the classroom all day, this may be the only time to be with their thoughts. Reframe the way teachers discuss working alone or spending time alone. Rather than automatically labeling it “anti-social,” talk with students about how creative achievers often experience breakthroughs, generate new ideas, and get more work done when retreating to solitude. Help students understand there are benefits to being both introverts and extroverts. In this present push for more collaboration, we might have forgotten that not everyone works the same and that spending large amounts of time with others can be draining for the introvert. Much emphasis has been placed on meeting the needs of diverse learners in school. I believe it’s time to include introverts into that group.